Why is Medicaid Coverage of Tobacco Cessation Important? In 2014, 32 percent of Medicaid enrollees were smokers, compared with 17 percent of the general population. Tobacco use is the leading cause of preventable death in the U.S., with more than 480,000 deaths each year caused by cigarette smoking.1,2 This includes 32 percent of all cancer deaths and 80 percent of lung cancer deaths.3 Tobacco use interventions are the gold standard in public health for cost-effectiveness, yet Medicaid spends less than .25 percent of the estimated cost of smoking related diseases on tobacco cessation efforts.4,5,6 While 68 percent of tobacco users report that they want to quit, those on Medicaid are lower-income and unable to pay for this lifesaving treatment out-of-pocket.7 Many Medicaid enrollees can successfully quit if they have access to a comprehensive tobacco cessation program with no cost-sharing. What Does a Comprehensive Tobacco Cessation Benefit Include? Medicaid enrollees are more likely to need cessation support given their economic status and higher likelihood of tobacco use, yet not all Medicaid plans provide a comprehensive tobacco cessation benefit. Federal law requires Medicaid expansion plans and marketplace plans (except those that are grandfathered) to cover all preventive services that receive an A or a B rating from the United States Preventive Services Task Force (USPSTF) without cost to the patient. Traditional Medicaid programs must cover these services for pregnant women and are incentivized to cover them for all enrollees through a one percent increase in their federal dollar matching rate. The USPSTF recommends, with an A rating, that clinicians ask all adults about tobacco use, advise them to stop using tobacco, and provide behavioral interventions and U.S. Food and Drug Administration (FDA)– approved medications to adults who use tobacco (except for pregnant women). A comprehensive Medicaid tobacco cessation benefit includes coverage for all three different types of counseling (individual, group, and phone-inclusive of the state’s Quitline) and seven FDA-approved pharmacological interventions (five nicotine replacement therapies and two additional prescription medications). Tobacco users should be offered at least four counseling sessions and a 90-day supply of medication for each quit attempt and at least two quit attempts should be covered a year. People respond differently to different interventions; therefore, coverage for a range of counseling types and medications is essential. 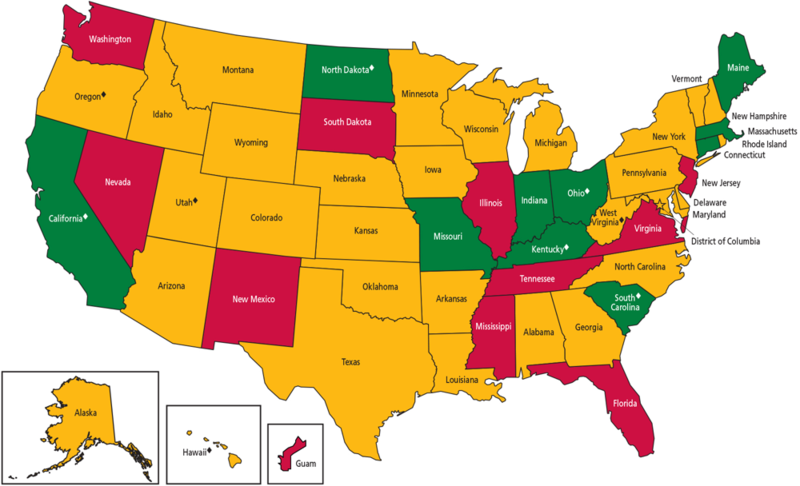 How Does Tobacco Cessation Coverage Vary by State? Medicaid cessation benefits vary significantly by state, and even within states, by plan. Ten states provide a comprehensive tobacco cessation benefit that includes coverage for all three types of counseling and seven types of medications for all enrollees. Conversely, enrollees in 10 states do not have access to even one type of medication or one type of counseling. Changes in coverage are needed to ensure Medicaid enrollees in all states have access to a comprehensive tobacco cessation benefit. Co-Payments are fixed charges paid by the enrollee at the time of service. Federal law prohibits marketplace plans and Medicaid expansion plans from charging co-pays for tobacco cessation treatment, but some traditional Medicaid plans still include co-pays for cessation services. Evidence shows that co-pays reduce the use of cessation medications and the overall success of quitting; therefore, states should not impose co-pays for tobacco cessation interventions in traditional Medicaid plans.9,10 Charging Medicaid enrollees a co-pay for the use of cessation service that may be available at no charge for higher-income individuals covered by marketplace plans further increases disparities in access to care. Prior authorization requires the physician or the patient to first get approval from their Medicaid program before receiving a prescription. This can lead to delays in treatment which could cause a patient to abandon treatment. It can also create an administrative burden for physicians, particularly if they provide care for a high volume of patients. Limiting the dollar coverage allowed for tobacco cessation is also a barrier to helping tobacco users quit. The cost of treatment depends on a variety of factors, including what type of medication and/or counseling a patient is using and the length of their treatment. Limits on the dollar amount Medicaid will spend on an individual enrollee prevents the enrollee from receiving the full course of treatment based on their individual needs for quitting sucessfully. Tobacco is incredibly addictive, and it may take many attempts to achieve the right treatment regimen that helps the patient successfully quit. Very few people achieve long-term success with an initial quit attempt.13 ACS CAN advocates that Medicaid fully cover a comprehensive tobacco cessation benefit for a minimum of two cessation attempts per year. Step therapy requires patients to try and fail using less expensive treatments before more expensive medications will be covered. This could force patients into a cycle of trying out treatments they have already deemed ineffective if they have to restart at the bottom of the ladder each time. The imposition of step therapy on tobacco cessation medications ignores the fact that some treatment modalities (patch, medications, etc.) are more effective for some enrollees than others. Personalized recommendations for the most effective treatment should be made for each enrollee, even if that means starting the enrollee on a more expensive medication. While the best practice to help people stop tobacco use is a combination of counseling and medication, Medicaid plans should not require patients to receive counseling before obtaining cessation medications. This could deter patients from even attempting to quit. An enrollee’s preferences should be prioritized and counseling requirements should not present a barrier to accessing FDA-approved cessation medications. Why should Medicaid reimburse Quitline phone counseling? Phone counseling, often facilitated through a service known as Quitline, is typically free for patients to use. State quitlines are just as effective as individual or group counseling, and may be more convenient. Currently, some states do not provide Medicaid coverage for quitlines, depending on state tobacco cessation programs for funding. Unfortunately, state tobacco control funds are limited and vulnerable to budget cuts. Medicaid reimbursement of quitlines for phone counseling increases the capacity of the quitline and provides an added layer of sustainability. Medicaid enrollees make up 39 percent of state quitlines users; therefore, it makes sense that Medicaid should provide reimbursement to the quitline for providing the service to enrollees.14 Including state quitline coverage under Medicaid adds a layer of financial protection and provides more resources so that the quitline can expand to accommodate new users. This allows the state tobacco control dollars to provide free telephone counseling as a last resort for those are not covered by another source. Medicaid can contract with existing state quitlines and either reimburse the quitline per user, like other services are reimbursed, or through an administrative match, where Medicaid pays a set amount to the quitline. It is financially beneficial for state budgets to have Medicaid reimburse quitlines because states receive a federal match for paying Medicaid expenses. ACS CAN recommends that Medicaid programs cover a comprehensive tobacco cessation benefit that includes access to all three types of counseling and all FDA-approved medications, without enrollee cost-sharing or other barriers. While federal law has been effective in increasing coverage of tobacco cessation services for pregnant women enrolled in Medicaid as well as enrollees in most private insurances and Medicaid expansion plans, there are still gaps in coverage when it comes to enrollees in traditional Medicaid plans. Requiring traditional Medicaid plans to provide a comprehensive tobacco cessation benefit and without barriers is key to helping people quit tobacco use. Ultimately this public health intervention will save money and lives. 2. Ku L, Bruen BK, Steinmetz E, Bysshe T. Medicaid Tobacco Cessation: Big Gaps Remain In Efforts To Get Smokers To Quit. Health Affairs. 2016;35(1):62-70. doi:10.1377/hlthaff.2015.0756. 3. American Cancer Society. Cancer Facts & Figures 2017. Atlanta: American Cancer Society, 2017. 5. Ward E, Jemal A, Cokkinides V, Singh GK, Cardinez C, Ghafoor A, et al. Cancer disparities by race/ethnicity and socioeconomic status. CA Cancer J Clin. 2004;54(2):78–93. 6. Richard P, West K, Ku L. The return on investment of a Medicaid tobacco cessation program in Massachusetts. PLoS One. 2012;7(1):e29665. 7. Tengs T, Adams M, Pliskin J. et al. Five-hundred life-saving interventions and their cost effectiveness. Risk Analysis. 1995;15:369–90. 8. McMenamin SB, Halpin HA, Bellows NM. Knowledge of Medicaid coverage and effectiveness of smoking treatments. Am J Prev Med. 2006; 31(5):369–74. insurance plans in a health maintenance organization. N Engl J Med. Sep 3 1998; 339(10):673-9. 10. Hughes JR, Wadland WC, Fenwick JW, Lewis J, Bickel WK. Effect of cost on the self-administration and efficacy of nicotine gum: A preliminary study. Prev Med. July 1991; 20(4):486–96. 11. American Cancer Society. Guide to Quitting Smoking. http://www.cancer.org/healthy/stayawayfromtobacco/guidetoquittingsmoking... (accessed 26 Jul 2013). 12. Final Recommendation Statement: Tobacco Smoking Cessation in Adults, Including Pregnant Women: Behavioral and Pharmacotherapy Interventions. United States Preventative Services Task Force; 2016. https://www.uspreventiveservicestaskforce.org/Page/Document/Recommendati.... Accessed July 14, 2017. 14. Survey of State Quitline Efforts to Build Relationships and Cost-Sharing Strategies with State Medicaid Agencies: Current Landscapes and Critical Questions for the Work Ahead. North American Quitline Consortium; 2015. http://c.ymcdn.com/sites/www.naquitline.org/resource/resmgr/medicaid/Med.... Accessed July 13, 2017.